Staying healthy tips | Run. Work. Live. Repeat. Have you ever avoided something you knew was good for you? Something you didn’t do even though you thought you should? 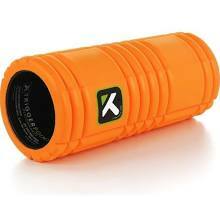 Until recently that was my relationship with “Freddy.” That’s my nickname for my Orange Grid Foam Roller (Retails for about $40). I confess: I avoided “Fred” and the idea of foam rolling for the longest time even though I knew it would help my muscles. Why? Because just like a real human relationship foam rolling has its ups and downs. For those of you unfamiliar with the benefits of foam rolling for muscle recovery and stretching here’s a link that explains it: Roll Away Injuries: The Benefits of Using a Foam Roller (Competitor, Feb. 2013). I credit Fred in part for helping me this go-around, but I also can’t lie. This committed relationship is definitely a love-hate one. Yes, my body and muscles feel better after I foam roll, but Holy Moses!! Does it ever hurt sometimes when I’m in the process of doing it?! My husband often stares at me in disbelief as I roll on the floor, wincing and occasionally yelling in pain. When I hit the right spots — the muscles that are too tight — it can hurt like crazy and I find myself having to breathe though it. The upside is I feel tremendous relief when I’m done and my running form has improved again over time. I don’t know if I will ever “fall in love” with foam rolling but as long it keeps me healthy, I’m sticking to it. And here’s the other thing I’ve learned — my “Boston or Botox” epiphany — from foam rolling regularly. As we get older it’s even more important not to avoid things that make us better and healthier. When you’re younger you can get away with shortcuts or pushing your body too hard without paying the consequences. That’s not true when you get older. Your margin for error grows slimmer to the point where you can’t afford not to do things that benefit you. Is there something you know you should be doing to be healthier or become a stronger? Maybe it’s remembering to put on sunscreen or a hat before you go outside to protect your skin? Or maybe it’s staying better hydrated when you run? Whatever it is, I encourage you to share it here. Start your own new “committed relationship” like I did. Your body will probably thank you later.